If you don't own a dishwasher, and you have to wash dishes yourself, you'll need somewhere to put your plates and other utensils to dry. There are a number of dish racks available on the market—there are stylish versions, where the main emphasis is décor. 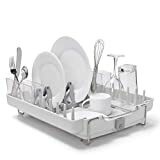 There are also compact types of dish racks, which you can fold or roll up after you have finished washing dishes. What you purchase depends largely on the amount of space in you kitchen. Here is a guide to some of the best dish racks on the market. 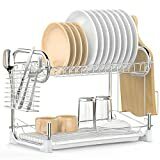 Steel frame: The simplehuman steel frame dish rack is made from fingerprint-proof stainless steel, which is practically rust-proof. Plastic: The Progressive Collapsible Over-the-Sink drainer is made from plastic. Wire frame: Surpahs makes a roll-up dish drying rack. The rack is made from a silicone coated steel wire frame. It is made to be suspended over the sink, where your plates can drip-dry. They also make a 2-tier version, with a steel skeleton supported by a plastic base. 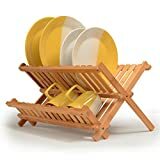 Folding rack: These can be folded or rolled up and removed from the kitchen counter. They're handy if you have limited counter-top space. Fixed rack: These are a permanent fixture in your kitchen. Here you can experiment with a design that complements the décor in your kitchen. Easy construction: You'll have to put the dish rack together yourself, so you should take note of whether the construction is simple or not. Catch Pan: The catch pan is at the bottom of a dish rack. You'll want to make sure the that catch pan extends out beyond the edges of the dish rack, so as to catch the runoff water. Number of tiers: This will determine how many dishes your dish rack can hold. The Better Chef DR-22 2-Tier rack holds dishes in the upper rack, while you can put cups and glasses underneath. There is also a tray for cutlery. The Surpahs 2-Tier rack has slots for plates on both tiers, and together the two tiers hold around 32 plates. Amount of space occupied on counter: You don't want an appliance that occupies a lot of space on your countertop. For example, the Progressive Over the Sink dish drainer measures 16.5 x 26.75 inches, but is made so that it collapses and is taken out of the way when you have finished washing dishes. 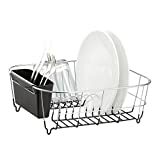 The Surpahs 2-Tier Compact Dish Drying Rack is 22” long x 17” high x 9” wide. 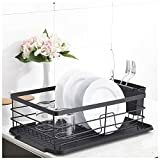 Drains easily: You want a dish rack that will let the water drain off the plates and cutlery, so that they'll dry more quickly. The simplehuman sku# KT1104 dish rack is designed with a multi-directional spout. This way, all the water flows off the dishes through a drain, straight into the sink, while the counter-top can remain dry. 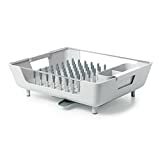 Doesn't need frequent cleaning: The simplehuman stainless steel rack tries to concentrate all the drain off water into a spout. But some complain that there are parts that remain wet for a long time. The result is a lot of mold and mildew growing in the various nooks and crannies. So expect to have to clean the implement once a month, to avoid mildew building up. 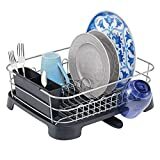 Holds pots, pans, cups cutlery: The Surpahs dish rack can hold bowls, pots, frying pans, tableware, cookware, cutlery, and kitchen utensils. You can also rinse vegetables over it and let them drip-dry. How many plates does it hold? : The number of slots in the dish rack will tell you how many plates it can hold. The simplehuman rack has 9 slots to hold plates, even though there are non-slotted regions as well. simplehuman—are located in Torrance, California. They are makers of simple, functional tools for everyday uses. They make trash cans and trash can liners, soap pumps, sensor mirrors, and kitchen and bathroom tools. Surpahs—are makers of kitchen and bathroom scales, and kitchenware products. They make water bottles, bath mats, bamboo products, and kitchen products. 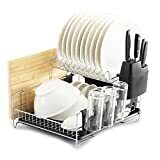 Surpahs makes a multifunction over-the-sink drying rack that is heat-resistant and dishwasher safe. They are located in Wilmington, Delaware. Progressive—is located in Kent, Washington. They make kitchen tools, food storage solutions, kitchen accessories, cooking and baking utensils, cleaning and organization utensils, and microwave-safe containers. Better Chef—are makers of kitchen and dining utensils. They make dish racks, omelette makers, sandwich makers, coffee and tea brewers, toasters, blenders, broilers, and much more.